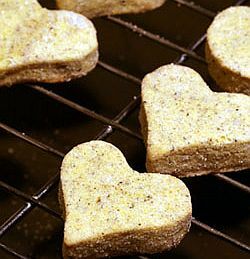 If you're in the dog house today for getting your soulmate a Chia Pet for Valentine's Day, you might want to bake some green tea heart-shaped cookies as a peace offering. Yummy! If anyone out there bakes some, I'm willing to "review" them for you!